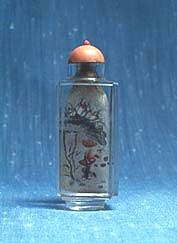 There are some really incredible antique Chinese snuff bottles, mostly made of glass, that have been painted, but on the inside of the bottle! When one looks at the size of the hole it does seem to be a very difficult achievement, yet they have succeeded in painting attractive scenes, often including calligraphy, such as a poem, or a few lines, apart from the artists signature. There are many poor modern inside painted bottles available, but there are some modern ones that can be very attractive to collect too. 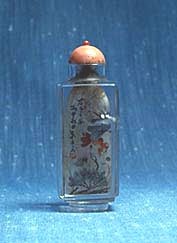 Some antique snuff bottles that are highly valued are painted with a portrait on one side and calligraphy on the other. When one considers, that they have had to paint the eye brows and eye lashes before the remaining essentials to create these portraits, that are so good and detailed that they almost look like miniature photographic prints, it is easy to understand why they are so highly prized! But what I feel are also remarkable are the inside painted snuff bottles that were not originally made to be painted by these artists. I know of a bottle where the painter has taken a very poorly hollowed rock crystal snuff bottle and painted the inside with a wonderfully detailed scene of colourful fish that extend all round the internal surfaces, it also includes his signature. In this instance the two internal opposite surfaces of the bottle are only about 3millimeters apart (about the same size as the hole) so how one side could be painted without spoiling the other is really hard to believe. 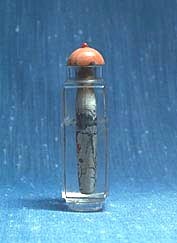 Keywords: Inside painted Chinese snuff bottles by John Neville Cohen, Chinese snuff bottles, Snuff bottles, Inside painted, Inside painted Chinese snuff bottles, glass bottles, painted on the inside, Chinese calligraphy, Chinese painting.